← Holiday Cards from Altpick Members :: Merry! Merry! When I was in the third grade we were given the opportunity to play an instrument. Since my beloved grandfather played the violin I decided on that. My grandfather Frank was self-taught in everything he did. Art and music were his passions and those passions were passed along to his children and grandchildren. He made his living as a painter/decorator painting murals, doing wood graining or marbleizing on walls in office buildings or in private homes. He supported four children on painting. He painted for a living and he painted because he loved it. He’d paint old wine bottles or furniture he’d find on the street and make them into beautiful art objects. He painted constantly and when he wasn’t painting, he was playing his violin. 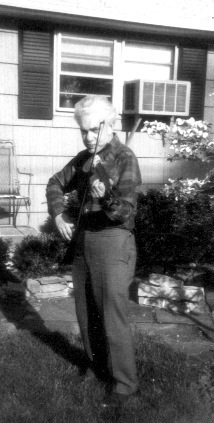 He loved to tell stories about how when he first came to this country he used to wait by the stage door at Carnegie Hall for Jascha Heifetz and offer to carry his violin for him. My grandfather was also a wonderful storyteller. I continued to play the violin through high school in various orchestras and for school plays. It was only when I decided to make art my focus did I give it up. 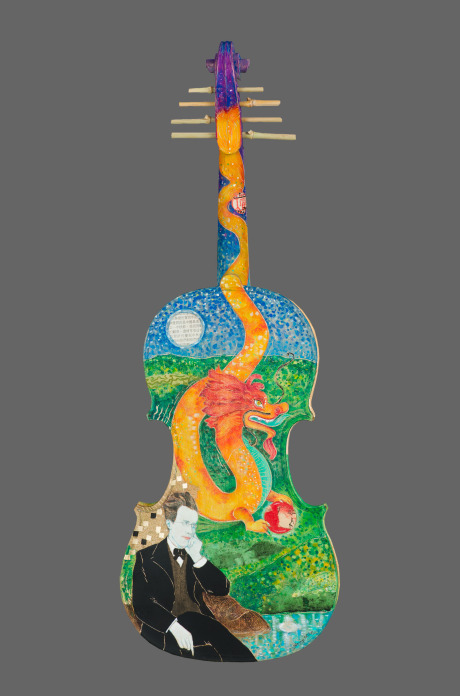 Last spring I learned that the New Jersey Symphony Orchestra did a fundraiser each concert season where they asked artists to paint an actual violin that would be auctioned off to support various education programs that the orchestra sponsored. I applied and was accepted as one of the artists for the 2013-2014 season. In late July I received an unvarnished violin . We were told we could pick a composer or a program or a particular piece of music to illustrate on the violin. I had a few months to complete it. I chose to interpret the orchestra’s winter program of Gustav Mahler’s “Das Lied von der Erde” (Song of the Earth) and a piece by a contemporary Chinese composer, Tan Dun whose “Earth Sonata” would be premiered. Both of these pieces were based on poetry by the 8th c. Chinese poet Li Bai. I wanted to work in my usual style of watercolor, colored pencil and collage but I wasn’t sure how any of it would translate on wood. I used a small paddle from a paddleball toy as a test board. I decided to paint the front of the violin in a Chinese style and the back and sides in a Vienna 1900 style a la Gustav Klimt. I created the tuning pegs out of bamboo to imitate a Chinese stringed instrument. I loved working on this project and working on wood was a revelation for me. 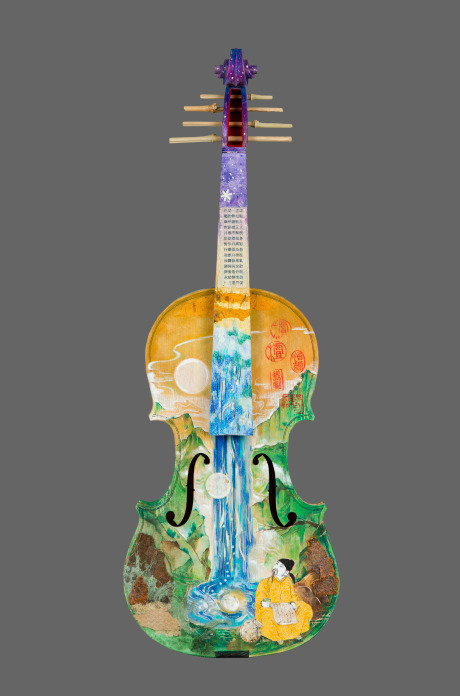 But I’m not joking when I say I loved painting this violin. To see more of Janice Fried’s work go to her website and Altpick page. This entry was posted in Altpick, Illustrations and tagged janice fried, music, violin. Bookmark the permalink.